The use of the communication and information technology tools can aid students in their lab work to add more flexibility to the accessibility and providing of up-to-date higher education allowing students accessing knowledge anytime, anywhere which will facilitate the lifelong learning and provide accessibility to the curriculum and other students' resources from anywhere at any time. Laboratory work by students in the information technology and engineering fields of study is a must requirement in all accreditation agencies and targeted employment places. This chapter demonstrates a project based learning technique that has been integrated with ordinary classes in computer network courses. The tools used in this study concentrates on the modeling and simulation of different aspect of computer networking that highlight different skills needed to any computer network engineer. Access to higher education via using communication and information technology means there are found a sufficient infrastructure to allow student access the university’s resources such as tools of the laboratory (Lab) and Internet help groups related to the Lab works. In recent years, the accessibility in higher education has been streamlined and advanced by the foundation of the information and communication architectures in many universities which in turn enhanced the availability of Internet, e-learning, distribution and observing of Lab work’s progress, continuity of building practical skills to the students (Hattangdi, & Ghosh, 2008). Moreover, the availability of such tools at university is improved accessibility to the web sites concerned with help and discussion groups of the lab tools via the Internet. However, recent development in communication and information technologies has removed the barriers that are possibly reducing the accessibility in higher education in previous decades in less development countries. 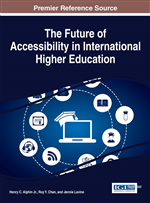 Thus, this can be used now as a means to intensify accessibility to higher education making education at anytime, anywhere possible (Bourne, Harris, & Mayadas, 2005). Consequently, accessibility in this context has been enriched the students capabilities to learn how to learn, supplemented their use of information and communication skills, team’s work skills, and enabled them to increasingly work out on their personal and professional development skills (Bridgstock, 2009). Design projects have been used as an important approach to incorporate hands-on developing different design skills in many courses of information technology (IT) and engineering specializations. Engineering career means practice (Clive, Alice, Ozgur, Daniel, & Larry, 2005; Feisel, & Albert, 2005). In addition, the success of IT and engineering education is a central key to industry sector, governmental organizations and services companies and it is the most critical service of the global economy in cloud computing era. Furthermore, Lab work has been proven significant to IT and engineering degrees (Clive et al., 2005; Feisel et al., 2005; Feisel, & Peterson, 2002). Hence, all engineering and IT core curriculum ought to include Lab practice classes accompanying the ordinary and tutorial classes in order to sufficiently prepare the future engineers with proper knowledge and skills to satisfy the next jobs’ requirements. Moreover, design is well thought-out as a key activity accomplished in engineering programs and none could imagine taking an engineering discipline without undertaking virtual or real Lab work so as to fulfill quality standards such as those described in Accreditation Board for Engineering and Technology (ABET) recommendations (Clive et al., 2005; Feisel et al., 2005; Feisel et al., 2002). However, it is seen that Lab activities motivate and enrich the student’s intention to learn many ideas and improve the professor’s teaching techniques by concentrating much on design concepts, in-depth analysis, and critical thinking skills that are needed in students’ future occupation. Modeling and simulation is used in computer networking classes to expand the design knowledge, skills and to make students be prepared to develop professional designs to real-world problems in this field of study. In computer network systems, simulations are playing an important role in experimenting, designing, and analyzing network systems since such systems are too large; it may take several parts of a country or more; too expensive to realize a real-prototype, and networking combines complex different processes that are implemented with variety of protocols, multiple devices and wide-range of technologies (Stallings, 2004; Paros, 2005).